Red Dead Redemption was released on May 18, 2010, for both the PS3 and the Xbox 360. Red Dead Redemption was developed by Rockstar San Diego, and the game released with a MSRP of $59.99. The chart above shows the sales ranks for Red Dead Redemption on the PS3 and the Xbox 360, with data captured between June 1, 2010 through June 30, 2010. 13 days had data recorded from them at different times, with a total eighteen sales ranks input on the chart. The highest recorded sale rank for Red Dead Redemption on the PS3 was #3, on June 1, around 1:05PM. The lowest recorded sale rank for Red Dead Redemption on the PS3 in June was #18, on June 30, around 12:10AM. The highest recorded sale rank for Red Dead Redemption on the Xbox 360 was #2, on June 1, around 1:05PM. The lowest recorded sale rank for Red Dead Redemption on the Xbox 360 in June was #15, on June 30, around 6:50PM and 11:40PM. 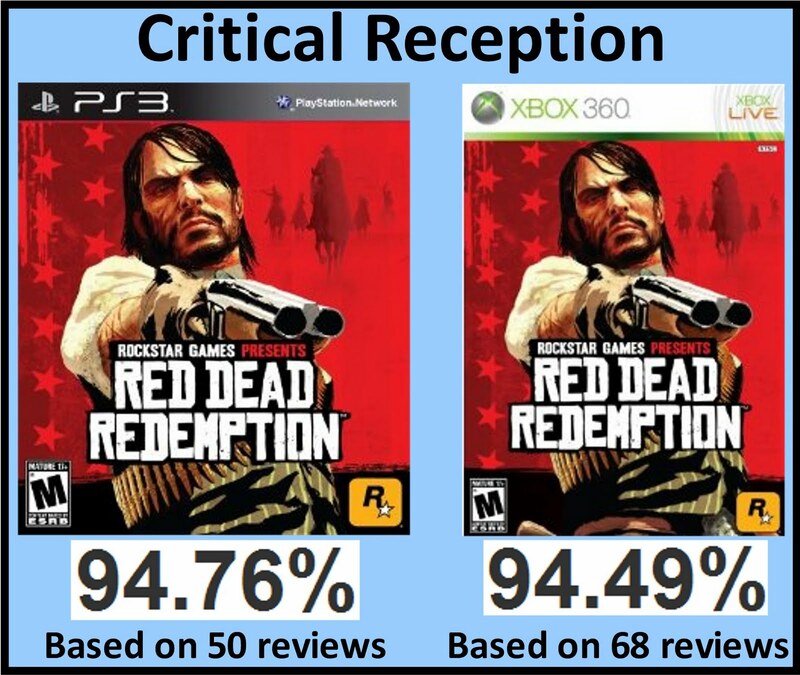 As I stated in the April/May sales ranks post, the first review scores for Red Dead Redemption started being published around May 17, the day before the game released. The following review score averages are from GameRankings.com's data. 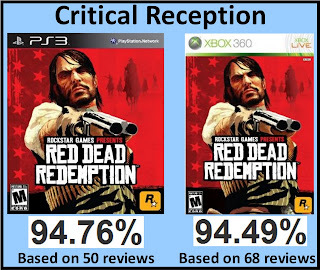 Red Dead Redemption on the PS3 now has a review score average of 94.76%, based on 50 reviews. Red Dead Redemption on the Xbox 360 now has a review score average of 94.49%, based on 68 reviews. I think it is safe to assume that both Red Dead Redemption versions will be in the NPD "Top 20" again for June, based off the Amazon.com data. The NPD sales numbers for June should be reported this Thursday, and I think it will be interesting comparing the Amazon.com sales ranks, with how Red Dead Redemption performs in the NPD numbers. The last time I posted they April/May sales ranks, the comments on both versions of the game were interesting. I think the last comment, from an "Anonymous" user was pretty interesting, because the comment included a link to NeoGAF, with comparison shots from both versions of Red Dead Redemption. I still don't understand why it seems developers have issues developing/porting games to the PS3 with the same frame-rate and graphical fidelity of the Xbox 360 versions. Do you think Amazon.com's sales ranks will line-up with the NPD numbers when they are announced Thursday? I think that both versions of Red Dead Redemption will probably be back in the "Top 10" again, what do you think? If you already purchased Red Dead Redemption are you still playing the game, or have you moved onto something else already? I've still not played this! But the announcement of zombie themed DLC sounds interesting :P--although I think it might only apply to the multiplayer. Anyway I find it interesting that PS3 sales are so close to 360's sales numbers because I assume there is a larger 360 install base. It gives me hopes for the PS3 yet! "I've still not played this!" Is it because of Monster Hunter? The one thing about the PS3 versus Xbox 360 sales of the game, is the PS3 version did have the "exclusive" content; and there's not much in a way of knowing with the data how much that helped(or not). Thanks for the comment! We need to do some more monster hunting soon! I'm waiting for a PC port of the game. If there won't be one for once, then I guess I'll pass on it even if I have more interest in this kind of scenario than any of the GTA ones. I haven't heard anything of the PC port, but I can see it happening. Also, I am like you in that I like the Western setting more than GTA's settings. I played the heck out of this for the 360 when I got it a couple of days after release. I keep meaning to write up a review on it, but just haven't yet. I didn't bother with the online modes hardly at all and haven't picked it up in a few weeks now to be honest, though I beat it. I have a friend that purchased it on the PS3, and he finished the single-player campaign also, but hasn't really done the online much.